Last weekend was the start of a very hot weather. The record high was 80's and I believe some areas reaches up to the 90's. Since it was a nice day me and hubby decided to go to the beach. We headed west to Ocean Shore. I was expecting a beach where you can waddle in the water and maybe swim but boy, the waves are big and the ocean breeze was too much for me to handle :-) If you stay away from the beach the sun is very hot but if you want to go near the breeze is too strong and it gets very cold. 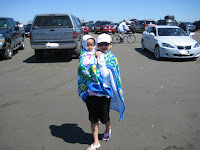 At first we went near the waters but the wind is strong and it's very cold so we got back to the car and took our beach towel. I wrapped it around me and our DD. Then for a couple of minutes let her walk on the sand and submerged her feet in the water. I decided to go back to our vehicle parked nearby because she started to get cold.